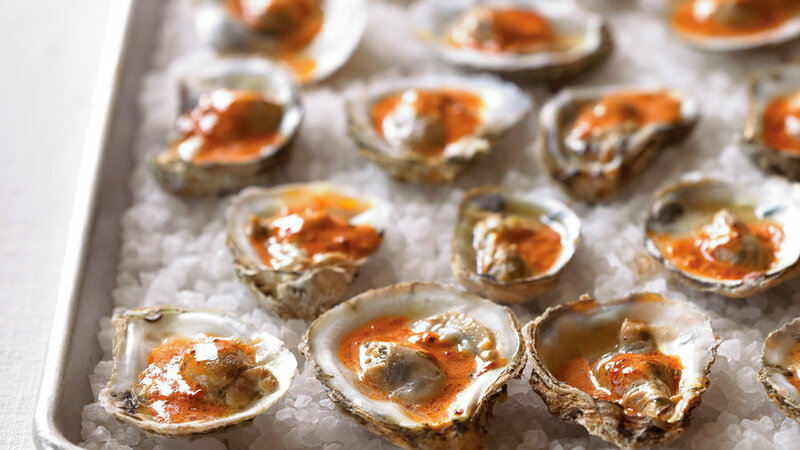 This barbecued oysters recipe is from Dory Ford, former executive chef at Portola Restaurant at the Monterey Bay Aquarium. 1. Whisk 2 tbsp. lime juice with oil, tequila, cilantro, 1⁄2 tsp. sea salt, and the pepper in a medium bowl. Add oysters and their juices, reserving bottom shells. Marinate oysters 30 to 45 minutes in refrigerator; drain, reserving about 1 1⁄2 cups marinade. 2. Meanwhile, soak shells in water for 30 minutes. Drain on a kitchen towel and pat dry. 3. Prepare a charcoal or gas grill for very high direct heat. 4. In a small bowl, whisk together butter, mayonnaise, chile and sauce, lime zest, remaining 2 tsp. lime juice, and remaining 1⁄2 tsp. sea salt. Set glaze aside (see tips below). 5. Spread rock salt on a platter large enough to hold oysters in a single layer. Arrange oyster shells on a large baking pan and spray insides lightly with cooking spray. 6. Set half of shells on cooking grate (balance on bars so they won’t roll over). Heat shells 30 seconds. Spoon 1 oyster into each shell with 1 tbsp. reserved marinade and cook (close lid on gas grill) until juices are bubbling, 2 to 3 minutes. Drizzle 1 tsp. glaze onto each oyster and cook 30 seconds more. Using tongs, carefully transfer oysters to platter, keeping them level so juices don’t spill, and nestle them in the salt. Grill remaining oysters the same way. Quick tips: Have your fishmonger shuck the oysters if you like; just ask that the juices stay in the shells to keep the oysters moist. Keep them cold and as level as possible in transport to avoid losing the liquid, and use them as soon as you can. If the glaze stiffens, set glaze on the hot cooking grate for a minute. Per 3-oyster serving: 146 cal., 86% (126 cal.) from fat; 3.3 g protein; 14 g fat (4.7 g sat. ); 2.9 g carbo (0.2 g fiber); 320 mg sodium; 41 mg chol.